OXFORD, Miss. – A University of Mississippi English professor has been named executive director of a national organization dedicated to the work of William Shakespeare. Karen Raber, an English professor who specializes in Renaissance literature with an emphasis on ecostudies, animal studies and posthumanist theory, has been officially announced as executive director of the Shakespeare Association of America. The nonprofit, professional organization advances the academic study of Shakespeare’s plays and poems along with his cultural and theatrical contexts and their roles in world culture. The association, founded in 1972, is housed at Georgetown University in Washington, D.C. The headquarters of the organization will move to the Ole Miss campus, and the executive director is the main point of contact for all members. “I was delighted and a tiny bit terrified,” said Raber of hearing the news. “This is a huge job, with a lot of moving parts, and so the challenge of taking it on is going to be enormous. Raber replaces Orlin, an English professor at Georgetown University, and assumes the new position June 1, though she will be involved in planning for next year’s conference and board meetings during this year’s meeting in March. The role is a part-time appointment, meaning Raber will continue to work and teach at Ole Miss. Raber’s new role will require a commitment from the university, in both funding and space, but Raber said UM Department of English Chair Ivo Kamps and liberal arts Dean Lee Cohen worked to put the necessary resources into Raber’s position. “I was elated when Karen got the news,” Kamps said. “This is an impressive achievement for her and for the English department. … Karen has been an incredibly productive and well-respected scholar over the last two decades, and she has reached that point in her career where she’s nationally and internationally recognized. Raber’s appointment as executive director of the Shakespeare Association of America is not only a clear recognition of her qualities but also of the rising esteem of UM, Kamps said. The position has typically been held by a professor from an elite Northeastern university, with Orlin holding the post since 1996. “Karen’s appointment suggests the premier Shakespeare literary association in the world is pleased to be associated with the University of Mississippi,” Kamps said. Orlin said the association has long been known for the uniquely democratic nature of its core activity: research seminars, in which scholars of different backgrounds, ranks and approaches come together to advance the state of knowledge about plays and poems that find new fans with every generation. 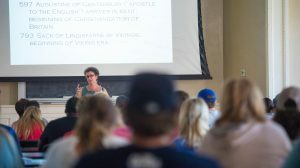 Raber joined the UM faculty in 1995, after earning her bachelor’s degree from Yale University and her master’s and doctoratal degrees from the University of California at San Diego. She is the author of three monographs, including “Shakespeare and Posthumanist Theory,” which is being released April 5 by The Arden Shakespeare. Raber also is the author of 2013’s “Animal Bodies, Renaissance Culture,” a finalist for the 2015 Association for the Study of Literature and Environment Book Award, and “Dramatic Difference: Gender, Class and Genre in the Early Modern Closet Drama,” published in 2001. She is the co-editor of several other works, including “Early Modern Ecostudies: From the Florentine Codex to Shakespeare” with Kamps and Tom Hallock, associate publisher of Beacon Press in Boston. In 2014, Raber was honored with the UM Faculty Achievement Award. The Shakespeare Association of America holds an annual conference each spring for association members to exchange ideas and strategies on Shakespeare, including a program of working research seminars. The association’s 46th annual meeting is March 28-31 in Los Angeles. The association also sponsors a number of seminars and workshops each year. More than 400 years after his death, the study of Shakespeare is as relevant as ever, said Raber, who started working on Shakespeare with Louis Montrose, a well-known Shakespeare and Renaissance literature scholar, when she worked on her Ph.D. at the University of California at San Diego.